I have been riding/building trikes since 1997. This past year my wife and I got together and wrote a novella called A Triker Christmas. We were shocked at the cost involved in getting a book printed. Then we found that you could publish a book electronically for Kindles and Nooks for free. The book can also be read on any computer screen. The first 20 pages or so are free to read. If you have time, I would greatly appreciate your reviews of the book. 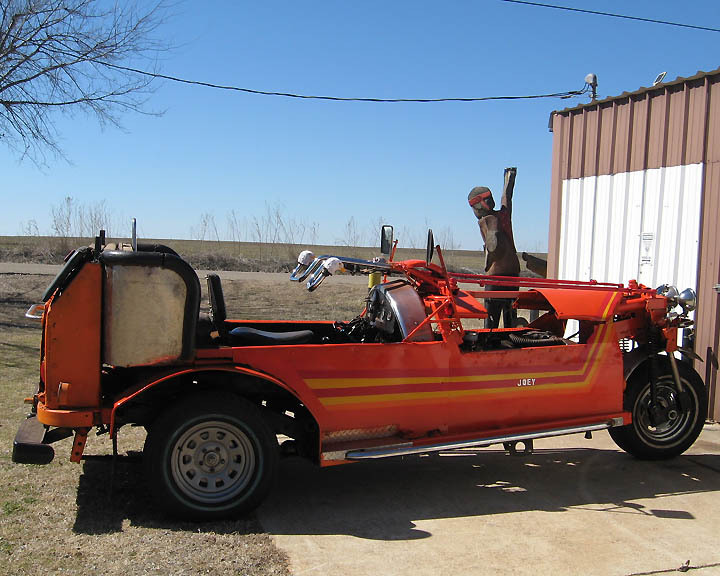 This is a 1977 DJ5 AMC Mail Jeep with a Honda front end. It is a straight 6 with automatic transmission. With this many lights on the front end they should be able to see me coming! Drove this one for awhile. Now parked in barn. I rode it in the Waco 2010 Veteran's Day Parade. 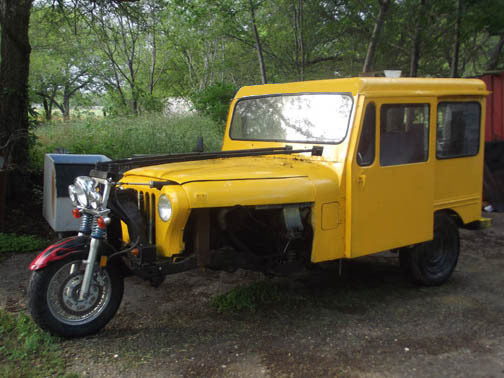 It has an "Ed Made" front end (if I have a flat, the spare will fit any of the three wheels), a Ford 6 cyl truck engine and a standard transmission. The above picture is no longer how this baby looks, however. I was never happy with it and it has since been gutted for parts. This was my second trike. It has a '69 VW Pancake Engine, and it is an Automatic. It has a Harley Wideglide front end and Boss Hog gas tanks. Trailer is not for sale. This is my first trike. It has a metal body on a Volkswagon rear-end. It has a '68 beetle engine. It has a 750 Honda front end. We trailered her to the BTW meet at the Berry Patch in Rapid City, SD in 2001. On the way she caught fire (electrical wiring burned up). I noticed her headlight was on and stopped, and smoke was just pouring out. I disconnected the battery, while my wife and daughter poured Dr. Peppers (only liquid available) on the flames. Boy was I disgusted. I spent the first day at the Berry Patch rewiring her so she'd run. But she did run before the day was out. 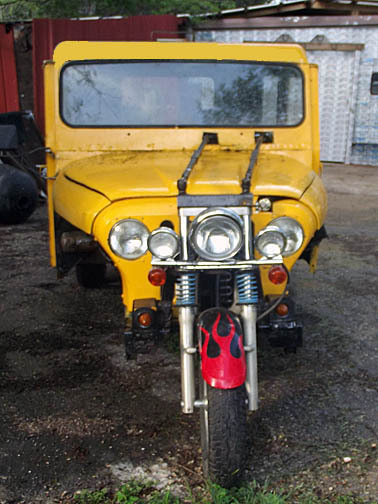 I've built this three wheeler back in 1997. It now has an extended front end, a stainless steel dash, a windshield, and it seats two (side by side). I've mounted signal lights, emergency flashers, fog lights, and an emergency brake. I also added a theft alarm (which burned up and I haven't replaced). It has had a top it, but I got tired of it and took it back off. I went to my first ever trike-in at Sturgis in 1997. Since then I've attend lots of bike rallys and trike rallys. So I made up an Event listing page of all the places I've been and you can see pictures from most of the events by clicking on the link. Click Events Table of Contents for the Event listing. 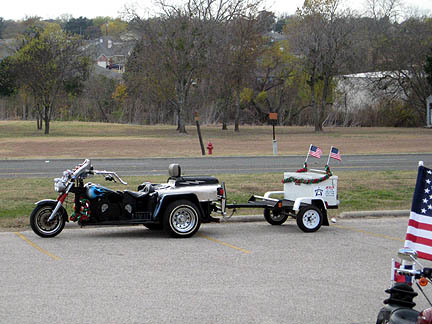 In 2003 when we headed down to the Lone Star Rally in Galveston, a tire blew on the trike. We had to go back home and get the trailor to take the trike back home. We went on down anyway. 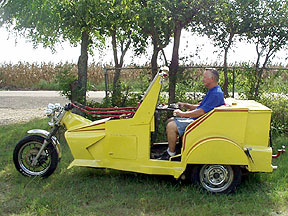 In 2004 we tried again and the trike made it. It was repainted right before we went. We had a good time in spite of the fact it rained all day Saturday. In 2005 Hurricane Rita messed up our plans to attend the Rally. 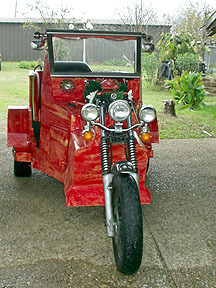 In 2006 we took the new trike to Galveston. In 2007 we didn't go, and in 2008 Hurricane Ike messed up our plans. We don't plan on going this year, maybe in 2010. I am a member of the Brothers of the Third Wheel. If you are interested in information of their events, click here... Brothers of the Third Wheel - Trikes. For refreshments in the Waco area stop by the Shade Tree on the I-35 access road (south bound) just past the Lorena exit or if going north, try Papa Joes on the access road just past Lorena. Papa Joes is where the Blue Knights hold their monthly meetings.